Celsius Resources (ASX: CLA) has announced further positive developments at the Opuwo Cobalt Project located in Namibia, prompting a share price increase of circa 10%. 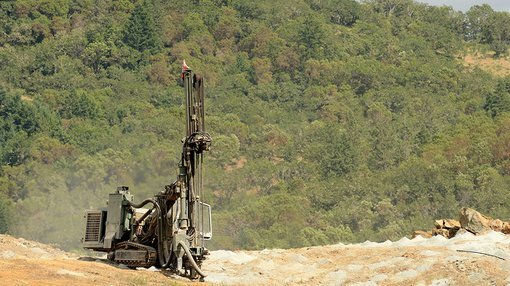 A total of 50 holes have now been completed by CLA, demonstrating mineralisation over a strike length of more than 15 kilometres. As a backdrop, the project has excellent infrastructure, with the regional capital of Opuwo approximately 30 kilometres to the south providing accommodation, fuel, supplies, an airport and a hospital. Good quality bitumen roads connect Opuwo to Windhoek and Walvis Bay. In the last week, CLA has discovered additional Dolomite Ore Formation (DOF) in a drill hole located approximately 350 metres north of the known and mapped mineralisation – with the prospect undergoing systematic testing through the current drill program. The location of the new mineralised zone relative to other drilling sites is shown below. The initial exploration target, consisting of between 33 and 41 million tonnes, grading approximately 0.13% – 0.17% cobalt and 0.45% – 0.65% copper, covers a zone of approximately 11 kilometres in the central portion of the project area. Management is of the view that the target has significant potential to be expanded given the drilling results from outside this zone, and the new mineralised zone announced today. However this is an early stage play and as such any investment decision should be made with caution and professional financial advice should be sought. However, CLA stressed that the potential quantity and grade is conceptual in nature, and that there has been insufficient exploration to estimate a Mineral Resource. At this stage, it is uncertain if further exploration will result in a Mineral Resource Estimate. Though these uncertainties prevail, there is no doubt the drilling results have provided a degree of confidence regarding the Opuwo cobalt project. “The identification of additional mineralisation approximately 350 metres north of the mapped and drill tested DOF horizon is an exciting development for the company, and we look forward to receiving the assays from these holes in the coming weeks,” CLA’s Managing Director, Brendan Borg said. The receipt of assays could be another share price catalyst, and it is also worth noting that the company is now conducting follow-up drilling in this area to enhance its understanding of how this impacts the broader project. 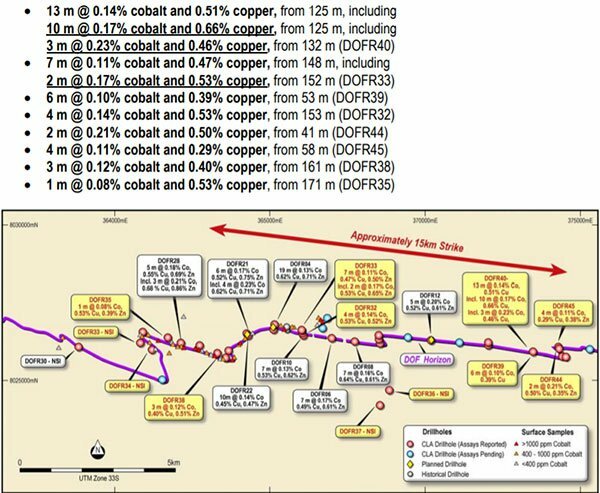 New sample assays have extended cobalt-copper mineralisation across a distance of over 15 kilometres as outlined below. 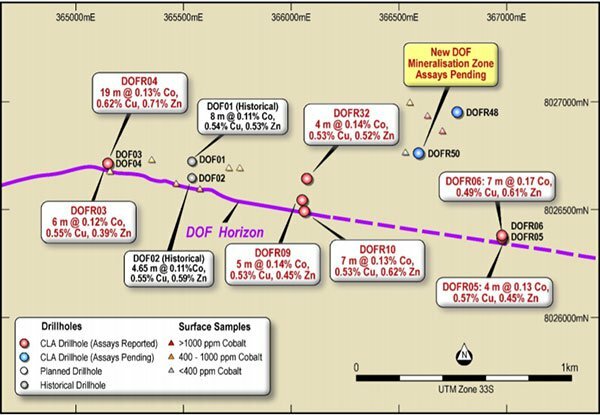 These results are consistent with previous batches of results received, and importantly continue to show potential for higher grade zones within the extensive mineralised system. Mineralisation extends to surface or near surface along the entire strike length investigated to date, and has now been demonstrated to extend to a vertical depth of at least 150 metres. This initial phase of reverse circulation drilling is designed to test a 20 kilometre strike length (part of a 30 kilometre strike) of the cobalt-copper mineralised DOF horizon, and is expected to be completed within the next two weeks. However, given the newly discovered mineralised zone, an additional two holes are being considered. Diamond drilling is continuing, providing samples for first pass metallurgical testing. Three holes have been completed, with another five holes remaining in the planned program. The diamond drilling program is expected to be completed in August with sample test results, once again a potential share price catalyst.